Most large enterprises struggle with project management. Software projects can be even more of a challenge because they require an interdisciplinary view that balances the perspective of technology, business, and customer. As our portfolio management office starts to mature I thought I would write a series of postings ("annals of project management") on lessons learned and lessons still being learned in our organization. Scott Berkun's The Art of Project Management is one of the best books in the field. 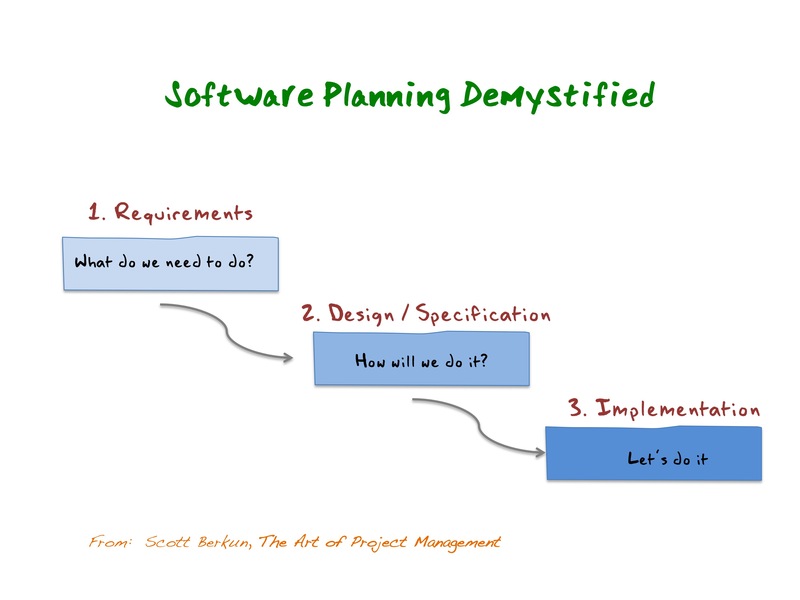 His "Software Planning Demystified" diagram is an "insanely simple but handy view of planning". A necessary though not sufficient condition for project success is that everyone in the organization, business and technology, should have the same understanding of how the process works: what are the boundaries of each step? what are the associated artifacts or planning documents associated with each step? who has requirements authority (i.e who is the decider); who has design authority? who has technical authority? who has budget authority? Projects are more than scope, schedule, and budget. 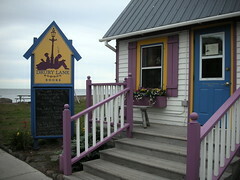 They have to be navigated on a sea of constant tension and negotiation between business and technology. In complex projects the same wave can either propel a project forward or sink it entirely. It's been less than a year since we created a Portfolio Management Office from scratch at Minnesota State Colleges and Universities. Here is a brief report on our experience, appearing as an article ("Order from Chaos") in EDTECH Magazine. 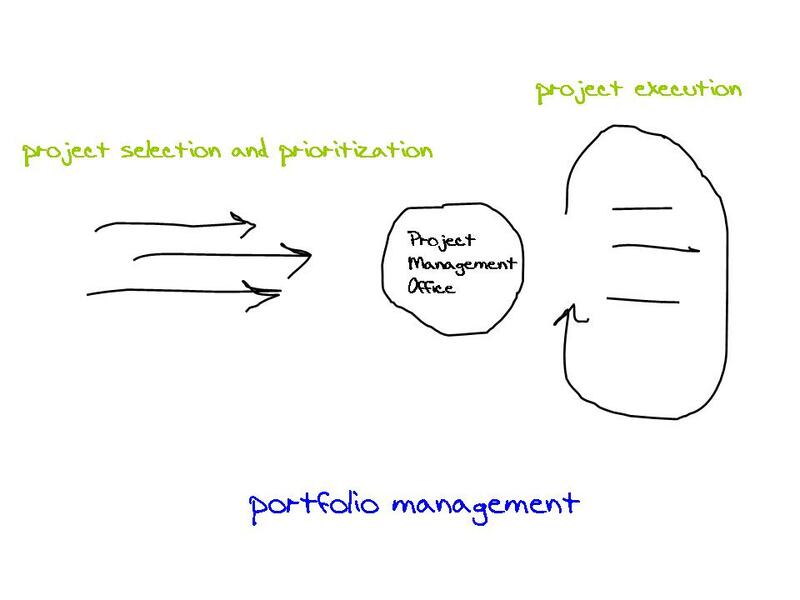 There are numerous definitions of portfolio vs project management. Here is how I think about the distinction. My organization recently launched a project management office (PMO) and we are learning something new every day. The right side of the diagram is about project execution: the core set of skills and discipline an organization needs to deliver projects well. The left side of the diagram is about project selection and prioritization: the mechanism by which the right projects appear on the doorstep of the PMO. Portfolio management unites the two by ensuring that the "right" projects are selected and then those projects are delivered "well". Portfolio management presupposes ongoing assessment of every project from suggestion to inception and then to completion. The concept is simple. Is it easy to achieve? Not by any means.